Sorry you are either not logged in or not a member of this site. Click here to login. Market analysis methodologies. Including: Momentum, Cyclic Analysis, Elliott Wave, Relative Value, Inter-market Analysis, Systems. One of the best classical methods of technical analysis brought up to date in this book by Chris Grafton. 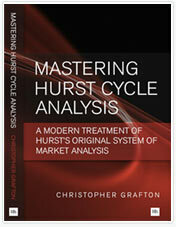 Elliott Wave International's Robert Prechter reviews Mastering Hurst Cycle Analysis.